Accurate operation is achieved using the oil damped 30mm faders. These can be set for either +/-6dB or +/-12dB boost and cut. 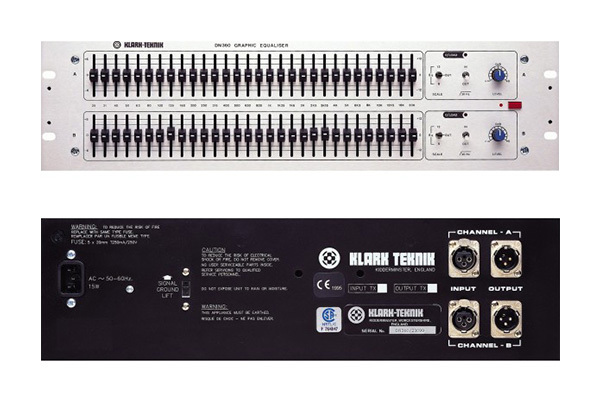 Sub-sonic filters on each channel help protect speakers and amplifiers, and a bypass function provides easy comparison between equalized and direct signals. Overload LEDs indicate problem levels. The unit utilizes proportional-Q filtering, which varies the "Q" value depending on the depth of either the cut or boost of a particular band. This results in a "smooth" and "musical" response, while still preserving the original source material. Accurate operation is achieved using the oil damped 30mm faders. These can be set for either +/-6dB or +/-12dB boost and cut. Sub-sonic filters on each channel help protect speakers and amplifiers, and a bypass function provides easy comparison between equalized and direct signals. Overload LEDs indicate problem levels.